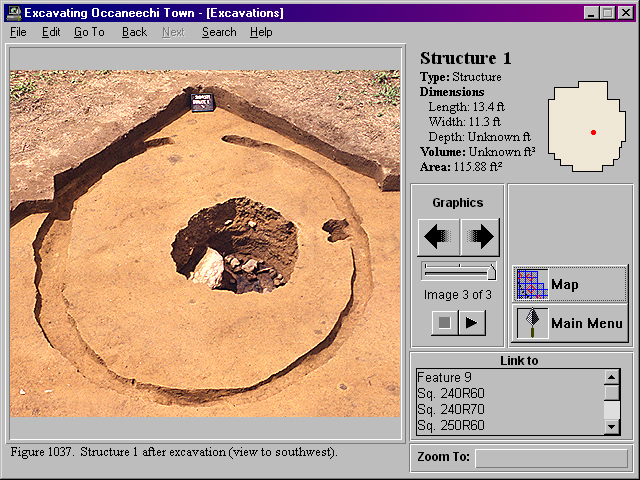 The CD-ROM Excavating Occaneechi Town: Archaeology of an Eighteenth-Century Indian Village in North Carolina has become a familiar site on my desk in the last few months. Not, I admit, because I have been avidly scouring its content on a regular basis, but because I have been putting off writing this review. A wealth of information can be an intimidating thing. A by-product of this delay was that I found myself with a shiny new computer to install the programme on. This rather neatly brought to light one of the crucial aspects of today's computer industry - the speed at which it moves. In-built obsolescence is, it appears, alive and well in our Gates-driven realities. 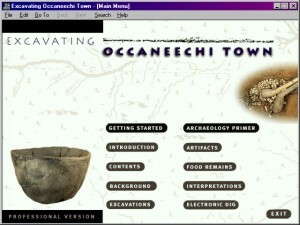 So the tag 'A CD-ROM for Windows' on the cover of Occaneechi Town is no longer as reassuring as it perhaps once sounded. In essence this means that this programme, designed rather neatly for Windows 3.1, has its fair share of teething problems with Windows98 and its associated hardware. But what my struggles to give life to the CD on my new, large monitor revealed was that all is not lost. This particular publication has not been left to flounder in the sea of operating systems past but is still being driven on by its creators through an excellent technical support page and FAQ hosted by the publishers, the University of North Carolina Press. This aided me through (or rather around) Windows98's installation rejections and offered a point of contact to provide a solution to the mute video clips I encountered. To be precise, the installation programme appears to have some conflicts with the now common wheel mouse, but installs fine when the wheel element is disabled. The sound error was caused by Asymetrix Toolbook II (the authoring programme for the CD) having problems with some more recent sound cards. I was pointed to a downloadable patch for the programme, which thankfully brought some of the best elements of the CD to life again. This CD seems in some ways to have been a long time in preparation. The archaeology to which it refers was done mostly in the mid-eighties, but the impetus to publish the results in electronic form only started in 1993. It would appear that the UNC archaeologists went from scratch to published CD-ROM in about four years - considerably faster than the majority of hardcopy monographs. This CD certainly represents a pioneering spirit but how does it rate eighteen months after release in the fast lane of IT development? And how does it live up to its claim to be both a 'valuable scholarly reference and a dynamic teaching tool'? The authoring package does certainly have its drawbacks, as an earlier reviewer has indicated (Eiteljorg 1999). This version of Toolbook does not allow for multiple windows and it can be frustrating when an illustration obscures much of the related information. Another element that has been rather overtaken by technology is the optimum display resolutions the package has been designed for. I found it required considerable tweaking to achieve optimum display on a 15 inch monitor and on a high specification 19 inch monitor, the loss of resolution, when running in the suggested graphics mode (leaving a rather forlorn window in the middle of the screen) is an unnecessary price to pay for full screen display. 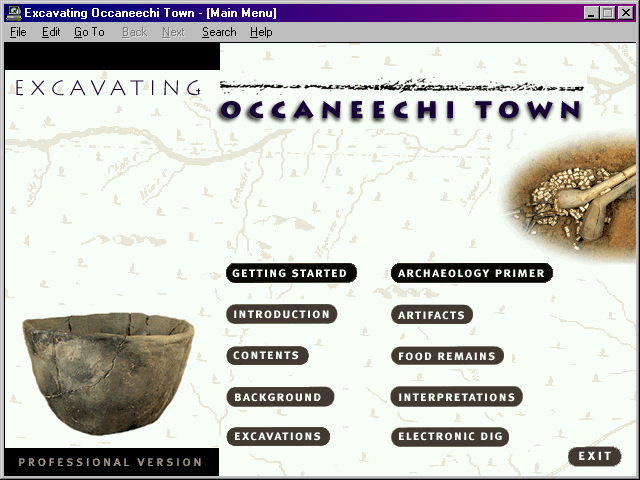 So, what greets you when Excavating Occaneechi Town finally appears on your 'Start Menu'? The title page is very attractive and well laid out, linking directly to the ten main options with clear buttons and pop-up descriptions (Figure 1). Unfortunately this graphic flair has not been carried through to any of the other sections, which revert to the ubiquitous grey of nearly all Windows-related products. This is at least a familiar norm. The navigation is relatively straightforward using hotlinked words and buttons at each stage, with a 'Main Menu' button always present. The programme does also have 'back' and 'next' functions, as well as a 'history' listing, available through the menu bar, and a drop-down 'go to' menu that includes a number of features not immediately apparent from the main graphical menu. These include direct access to the bibliography as well as links to the artefact databases, which is the only way of accessing these resources without chasing through an individual find from the excavation pages. Overall the navigation is simple as most of the sections are linear in both structure and layout, with the intended path a clear option. This works very well where the linear form is prevalent but it is easy to end up slightly wayward when in the midst of the less prescribed navigations, i.e. from text sections through the excavation pages to the artefact databases, or from the databases to an artefact photograph through the excavation pages. In general the complexity of links is adequate, although somewhat inconsistent, a point I will return to later. These introductory and explanatory sections are the natural ways into the CD for those either unfamiliar with the technology or with archaeology. The 'Getting Started' section gives an overview and a useful annotated guide, with hypertext links, to the relevant sections of the CD. The 'Archaeology Primer' is altogether more ambitious, however, attempting to give an introduction to archaeology for the novice, prior to exploration of the site through the CD. 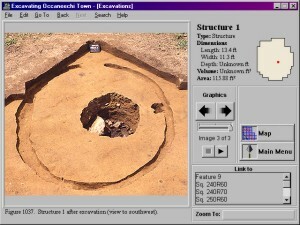 It just about succeeds in offering explanations of the methods used specifically at Occaneechi Town, but is highly simplified and has no real scope beyond this excavation. It also sports a smattering of semantic ambiguities, most noticeably in some confusing statements relating to the classifications of pits, and inferences relating to the intentionality of depositional processes. These seem to suggest that this section was either produced in a hurry, or produced by an non-archaeologist and not reviewed quite as rigorously as it might have been. The Primer does, however, describe the documentation process well and would probably give a non-archaeologist the chance to gain a lot more from the CD than they might otherwise have done. It is also pertinent to the excavation process as manifested in the other sections of the CD, allowing a rapid transfer from tutorial to exploration. The 'Electronic Dig Tutorial' is a step-by-step guide to using the 'Electronic Dig' teaching package that forms part of the CD. This is the 'dynamic teaching tool' acclaimed on the cover. The tutorial guides you very clearly through the teaching package and provides valuable explanations of the different strategies available to the 'digger'. It might have been better if both of these tutorial elements had been integrated into the package as a whole. This would have enabled a much more fluid use of the resources for the novice and it might have been possible to overcome some of the linking inconsistencies of some of the other sections, especially the glossaries of terms in the artefact sections. The meat of the CD can be divided neatly into two. There is the textual material, sourced from previously published papers on the excavation and its finds, and the excavation material, presented in navigable form through clickable maps and databases. The degree to which these two parts link together varies considerably between each section; indeed the degree to which each section itself uses the medium, by linking within itself to illustrations and to video, seems inconsistent. Some sections appear much stronger than others as they integrate better into the programme as a whole and use the multimedia facilities to the full. The 'General Background' section is one example of this. It is divided into three chapters: one on the archaeology, documenting the history of the discovery of the site and placing it in its regional and local context, and two chapters on the historical setting for the archaeology. The archaeological chapter makes good reading and excellent use of illustrations and maps. It presents an inspirational compendium of material that draws together archaeological and historical sources and presents them in a clear and concise way, drawing the reader into the subject. 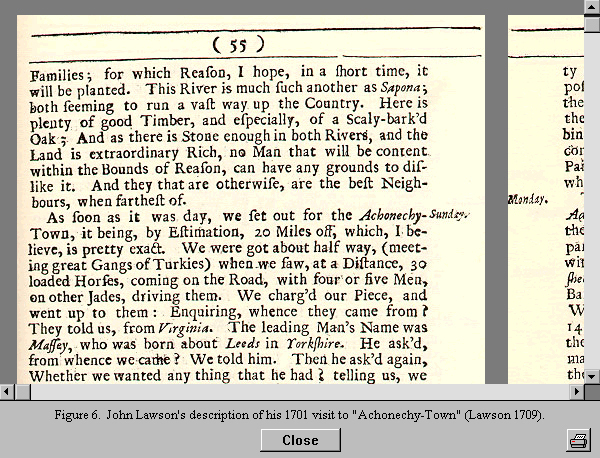 The presentation of a page from one of the historical sources (John Lawson's 1709 journal of a journey through Carolina) is a highlight (Figure 2), using the medium to offer direct contact with the original source. The subsequent historical chapters however proceed to disappoint in this respect. 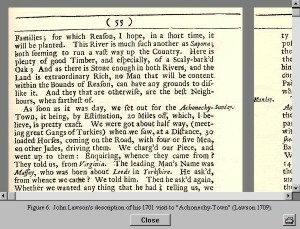 They are labelled as 'History 1525-1725' and 'History 1725-present', and while both are well written neither utilises any illustrations, and the second chapter seems to be a very specific history of the Occaneechi band of the Saponi Nation as a distinct tribe and, although interesting, is not really a general history of the area. This would appear to be indicative of one of the main failings of the CD as a scholarly publication. Much of the textual content has been adapted from previously published papers and not written specifically for either the medium, or the publication itself. The result is a certain lack of consistency through the CD and the sense that some material has been squeezed into a predetermined publication format and labelled as what ought to be present, rather than what it actually contains. This unease continues through the rest of the textual material. Some sections of the chapters on the artefacts and food remains use the medium to a much greater extent than others. All the sections do link through to specific features in the excavation pages, but the complexity of interconnections varies considerably to the extent that whilst some sections seem to open up the data for exploration, others seem to frustrate and obstruct. That said, the artefact discussions are comprehensive and represent some of the strongest elements of the scholarly aspects of the CD. One noticeably absent feature is the ability to link directly to the artefact databases from the discussions. The databases are perhaps the most strikingly under-used aspect of the resource. This may be because the producers were slightly afraid that the computing power necessary to run them frequently might slow the package down. The database is easy to use and allows useful sorting of the contents, enabling readers to get to grips with the material in their own way. 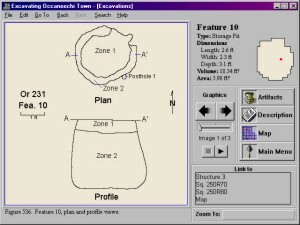 The excavation pages (Figure 3) do allow navigation in both directions, i.e. from an excavated feature to the artefact inventory, to the database and back again, but the ability to move directly from the discussion of an artefact to its entry in the site database would have been a powerful tool and is an opportunity missed. The ability to browse the excavation is compelling. This is where the true nature of the medium becomes apparent. The site is searchable through grid squares, features or structures. 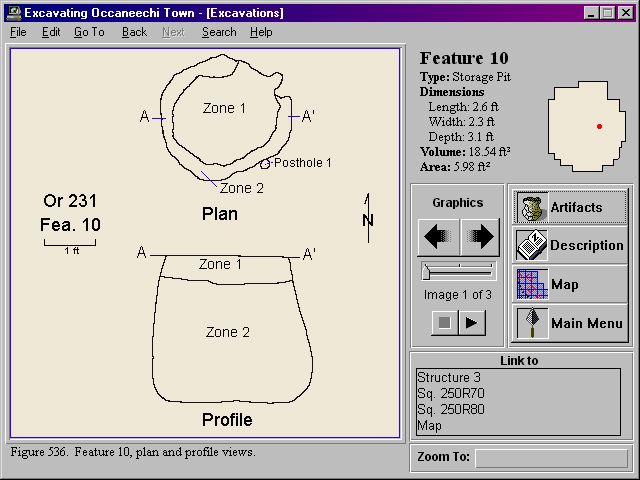 Each element prompts further investigation (Figure 4), offering descriptions, plans and sections, as well as photographs of the excavation stages (Figure 5). The artefact inventory then links to photographs and subsequently the database. Figure 4: Investigating the site further. Note the 'slide show' graphics function here rather than the overlying window as in Figure 6. These are the same pages that can be reached through the artefact discussions and represent the most successful aspect of the CD, truly allowing readers to navigate through the material, following the trails that take their fancy. The images are of a good quality and reproduce well on the screen (although higher resolution versions are available on the CD itself) and the slide show feature of the excavation browser works better than the overlying window that most of the other illustrations utilise. One of the other successful uses of the multimedia capabilities of the programme is the inclusion of video in the interpretative section of the CD (Figure 7). It is hard to understate the powerful nature of an interpretation presented by its proponent in an apparent face-to-face environment. Whilst the quality of the pictures is not fantastic, they do represent a compellingly fresh way to present subjective material. It is in this context, rather than in its illustrative use in the 'Archaeology Primer', that this element of the medium seems to have found its natural home. It was certainly worth the effort to fix the sound problems I encountered. The interpretative section reads as an altogether more coherent element than the artefact discussions. This is probably because it was authored by two of the main editors of the CD, giving it a true feeling of being a synthesis of the site. Its main shortcomings would appear to be (from my Anglo-centric, prehistory-orientated position) a distinct theoretical naivete, particularly with respect to the discussions on the burials. The conclusions drawn seem, to a degree, to lack a concrete footing - elements seem to be missing from their foundations. This is all the more frustrating as the interpretations seem both plausible and very interesting. It is worth noting that all the data, texts and images that make up the content of the CD are available in a variety of file formats should you wish to examine the primary data using different software. This might be useful for exploring the texts since the 'text search' function refused to behave itself for me through the programme itself. 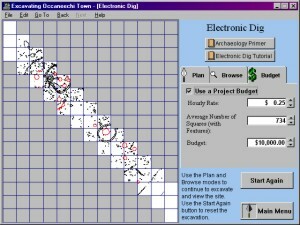 The Electronic Dig: 'a dynamic teaching tool'? As one of the highly promoted elements of the CD, the 'Electronic Dig' deserves special consideration. The knowledge that the package is already available for teaching purposes in some UK university departments says, I hope, more about the suitability of the programme than merely that it is one of the only (if not the only) excavation simulation suitable for a Windows95 environment. 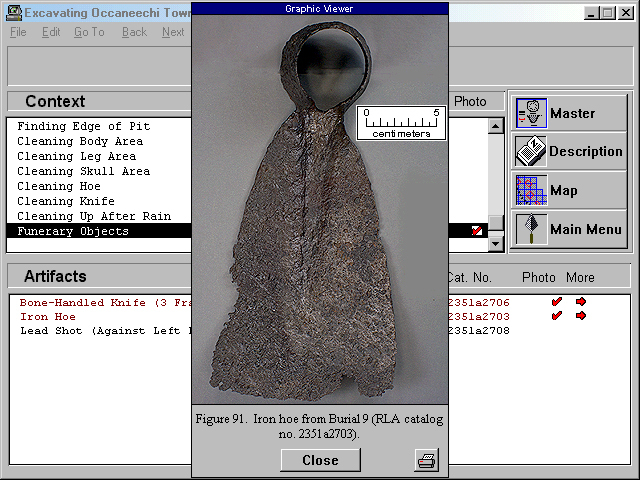 The strength of the simulation lies in the fact that it uses as its basis the excavation browser, utilising the full database of the site. As such, it is possible to examine the material at the closest level. It works primarily because it does not try to involve anything more than simple excavation sampling strategies. It is possible to involve a financial element, and to run the simulation as a separate entity with controlled budgets (Figure 8). The only major flaw I encountered was that it was possible to pay deplorably low wages without complaint from your virtual diggers, allowing a meagre budget to go slightly further than it would in reality! It would perhaps benefit from a more integral means of compiling the findings of the simulated excavation, into a virtual fieldbook for instance, but the ability to export the simulated dataset in suitable formats is very valuable. 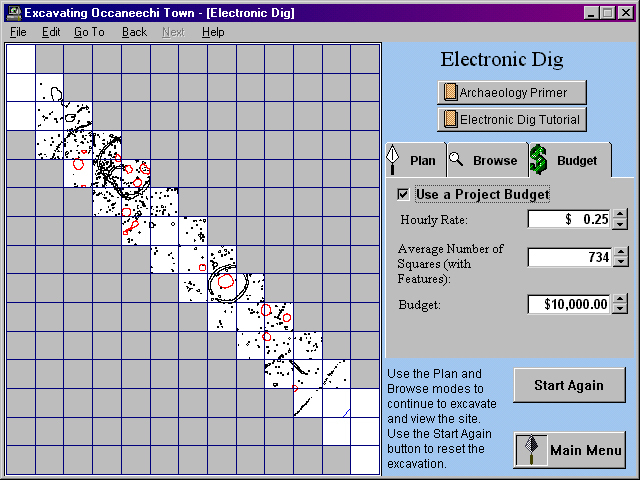 Figure 8: The Electronic Dig – with the hourly rate at typical student level! Another loophole, and probably more difficult to plug, becomes apparent when you get as far as the artefact databases through the 'Electronic Dig'. Having reached the database, you can view the artefacts from any context without having excavated the relevant features. However, at least it is not possible to complete the loop and access the feature descriptions. Although it might seem harsh, it is important to assess this publication on the claims it makes about itself. It claims to be both a full site report and a teaching package. In the case of the latter it fulfils the definition, if not completely. 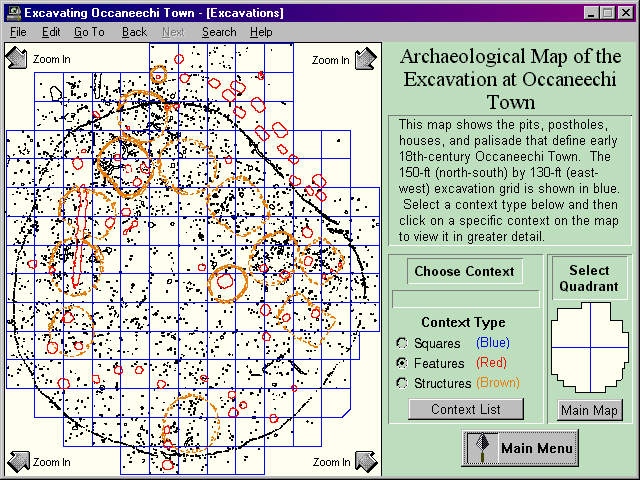 The simulated dig works well and uses the data resources to the full. It offers the opportunity to explore the variations that different excavation strategies could have on the resultant dataset and the conclusions that might be drawn from them. It is, unfortunately, as a site report that the CD is most lacking. The use of electronic publication should be a chance to expand the extent of a publication whilst retaining accessibility. This should not just be in terms of the raw data, which Excavating Occaneechi Town does admirably, but across the breadth of the publication spectrum. In this case it seems that, to an extent, the medium has come before the message. This can probably be forgiven in what was a pioneering effort, but if electronic media are to be taken seriously as a means of publication, the quality of the published material must be of paramount importance. The textual content of Excavating Occaneechi Town has the air of an afterthought following the efforts of the browseable excavation. It is the patchy coherence of the content that serves to undermine the strength of the material, almost as if more thought has gone into the creation of the data than the examination of it. The texts do not sit together well and sometimes lack the theoretical backing, both in the archaeology and the use of the medium, to be considered as a successful publication in their own right. But the crux of the matter is that although Excavating Occaneechi Town is not everything it purports to be, it is a valuable addition to archaeological publishing. Others will surely follow in the UNC archaeologists' footsteps, and perhaps do a better job, but this will always be the downside of being pioneers in a field.